Michele Brody is inspired by the practice of sharing tea and making handmade paper. 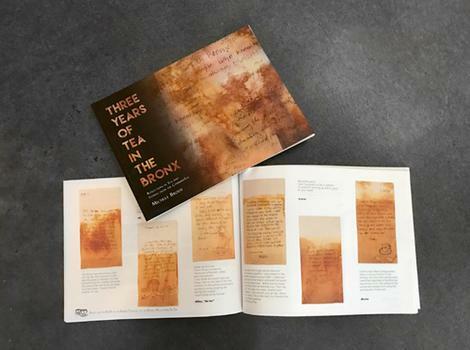 Reflections in Tea: Three Years of Tea in the Bronx is a 10th year Anniversary celebration of Reflections in Tea through the compilation of stories and poetry gathered while sharing tea for the past 3 years with local communities in The Bronx. Michele Brody is an environmental community-based artist who has had one-person shows in France, Costa Rica, Chicago, Germany and throughout New York City at chashama, Littlejohn Contemporary, Brooklyn Botanic Garden, Julio Valdez Project Space, Lower East Side Tenement Museum and the Bronx Museum. She has received an artist grant or residency almost every year since receiving her MFA from The School of Art Institute of Chicago in 1994, including the Pollock/Krasner Foundation, New York Foundation for the Arts, Bronx Council on the Arts, Skowhegan, Marin Headlands Center for the Arts and Marie Walsh Sharpe Art Foundation. In 2011 she was awarded Best 3-D Entry at the international Art Prize competition in Grand Rapids, Michigan, and has completed two permanent public works of art for the MTA and DOE in The Bronx where she currently works and resides.